Pathology of the external and middle ear is the most frequent reason to prescribe antibiotics and perform surgery in children and young adults. In the majority of cases imaging studies are not performed; the need for imaging comes when complications are suspected or when treatment is not effective. This paper discusses indications for temporal bone imaging studies and presents the most frequent pathological conditions, together with differential diagnosis, clinical symptoms and methods of treatment. This pictorial review describes major external and middle ear diseases, with special regard to clinical findings and appropriate reporting. Apprehension of the complete clinical picture, together with imaging clues, narrows differential diagnosis and helps avoid mistakes. Evaluation of temporal bone pathologies requires close cooperation between the clinician and radiologist. Pathology of the external and middle ear is the third most common reason of visiting a general practitioner or a family doctor [1, 2]. In children and teenagers, inflammatory conditions of the middle ear are the most frequent reasons to prescribe antibiotics and perform surgery . In the majority of these cases, proper diagnosis is made by clinical examination alone and patients will not benefit from additional diagnostic imaging studies. However, the prevalence of ear infections increased significantly between 1980 and 1996, and this may suggest that the current approach to preventing and treating middle ear inflammation is not adequate [2, 3]. Therefore, especially in complicated and recurrent conditions, imaging plays an important role; imaging findings may fundamentally influence the treatment . Also, in non-inflammatory conditions of external and middle ear computed tomography (CT) or magnetic resonance imaging (MRI) would provide a diagnosis and/or necessary information for surgery in a significant number of cases [5, 6, 9]. Usually, patients with temporal bone pathology first undergo clinical examination, often with audiology tests. Information obtained this way, when combined with imaging findings, provides an accurate and trustworthy diagnosis, allows avoiding misinterpretation and ensures appropriate treatment. Absence of external ear canal being a birth defect, and accompanied by auricle malformation. Conductive hearing loss. On clinical examination, usually the auricle is malformed (microtia) and the EAC is not patent or significantly narrowed. In such ears the sound cannot reach the tympanic membrane; this is why conductive hearing loss results. High-resolution CT (HRCT) of the temporal bone is the method of choice. Since atretic external auditory canal does not allow visualization of tympanic membrane and middle ear structures, imaging studies are mandatory . Radiological findings are critical for accurate classification of the severity of disease and surgical decision-making. For selection of best surgical candidates, images should be evaluated according to the grading system proposed by Jahrsdorfer et al. , who evaluated eight critical areas of temporal bone anatomy, each area receiving 1 rating scale point, with the exception of the presence of a stapes, which received 2 points (Table 1). Patients with a pre-surgical rating of ≤5 points should not be considered surgical candidates. A pre-surgical rating of 8 points translates into an 80% chance of resorting hearing to normal or near-normal levels. Often the malformation involves ossicles and middle ear space to varying degrees. The inner ear is most often normal . Among frequently observed middle ear developmental anomalies are: hypoplastic middle ear cavity (Fig. 1), deformed ossicles (Fig. 2), oval window atresia, aberrant course of the facial nerve, absent or hypoplastic tympanic bone (Fig. 3). Acquired EAC stenosis (surfer’s ear), EAC osteoma, EAC cholesteatoma. if the other ear is functioning well, unilateral atresia is not treated. Bilateral atresia is treated surgically at the age of 5–6 years. Usually middle ear surgery is preceded by auricle reconstruction. It is unnecessary to perform CT examination in early childhood, before the middle ear grows to almost-adult size. Unilateral atresia is also effectively managed with a Baha—a surgically implantable system which works through direct bone conduction. Infection involving primarily bony and cartilaginous external auditory canal and adjacent structures, being a relatively rare complication of external otitis. It occurs usually in immunocompromised persons, especially elderly patients with diabetes mellitus, and is often initiated by self-inflicted or iatrogenic trauma to the external auditory canal . Clinically, patients complain of severe otalgia that worsens at night, and otorrhea. Otoscopic findings include granulation tissue in the external auditory canal, particularly at the bony-cartilaginous junction. On audiology there is conductive hearing loss . Imaging modalities include CT and MRI. While CT scanning allows to determine the location and extent of disease, MRI is the method of choice in determining intracranial extension. Since malignant external otitis has potentially life-threatening complications, imaging studies are strongly advised . Thickened mucosa of the external auditory canal and auricle, enhancing after contrast medium administration (Fig. 4), together with destructive, osteomyelitis appearance of the tympanic and mastoid bone (Fig. 5), strongly suggest malignant external otitis. Subtle cortical erosions visible on CT are usually an early sign of evolving osteomyelitis, as well as infiltration of the temporomandibular fat pad . Meningeal enhancement, visible on MRI informs about intracranial extension. Focal areas of rim-enhancing fluid visible in adjacent soft tissues are consistent with abscesses. Absolutely critical is posteromedial extension to the jugular foramen or carotid space. Includes EAC cholesteatoma, post-inflammatory medial canal fibrosis, keratosis obturans and EAC squamous cell cancer. Note: it may be very difficult to differentiate between EAC cholesteatoma and malignant external otitis, because of the same pattern of bony invasion and soft tissue mass. Attention should be paid to clinical history [6, 12]. Surgical debridement of visible granulation plus systemic antibiotic therapy. Drainage of abscesses. benign-appearing bony protuberances, arising from the osseous portions of EAC. They are found commonly in people with prolonged, repetitive exposure to cold water (“surfer’s ear”) [6, 13] . conductive hearing loss and recurrent episodes of external otitis with otalgia. HRCT of the temporal bone is the examination of choice; intravenous contrast is not required to make the diagnosis. exostoses are typically seen as benign bony overgrowth with normal overlying soft tissue, always bilateral, and located close to the tympanic annulus at the tympanomastoid and tympanosquamous sutures (Fig. 6) [13, 14]. The lumen of the EAC may be significantly narrowed (Fig. 7). Includes: radiologically, EAC osteoma; clinically, medial canal fibrosis, necrotizing external otitis and EAC cholesteatoma. On imaging, the last three entities are visible as soft tissue lesions with or without bone destruction. A history of cold water and wind exposure facilitates the diagnosis . Usually require no treatment, sometimes may require surgical excision. post-inflammatory, acquired atresia of EAC. The disease is characterised by formation of fibrous tissue, overlying lateral surface of tympanic membrane. In many cases (∼60%) it occurs bilaterally [4, 6]. Clinically the disease may be discrete, with conductive hearing loss, otorrhea and history of chronic otitis. Temporal bone HRCT is the examination of choice. medial canal fibrosis typically is seen as a homogenous soft tissue against the tympanic membrane (Fig. 8a, b), there are no EAC bone changes. This includes keratosis obturans, EAC exostoses, EAC cholesteatoma, necrotizing external otitis, squamous cell carcinoma of EAC. Surgical intervention. At early phase topical antibiotics and steroids may help. Neoplasm in the EAC. This tumour has an aggressive nature and spreads along vascular and neural pathways, invading adjacent structures . Most squamous cell carcinomas of the temporal bone occur in the 5th and 6th decades of life. These include otorrhea, otalgia, hearing loss and bleeding. Diagnosis is usually delayed because symptoms are similar to other benign otological conditions such as chronic suppurative otitis media or EAC cholesteatoma [15, 16] . Temporal bone HRCT best predicts tumour extent in terms of osseous destruction; in larger lesions, enhanced MRI images are necessary to assess soft tissue and intracranial involvement, also perineural spread. Imaging should always include parotid gland, since parotid nodes are a first-order drainage nodal group. A mass in the EAC, with underlying bony destructive changes (Fig. 9). Very small tumours may not infiltrate bone; they present only as lobular, soft tissue mass. Larger lesions spread around the auricle, infiltrate parotid gland and enhance heterogeneously after contrast (Fig. 10). It should be remembered that bone invasion predicts treatment outcome. This includes medial canal fibrosis, keratosis obturans, necrotizing external otitis and EAC cholesteatoma. These depend on the tumour stage (see Table 2) and are generally based on the combination of surgery and radiotherapy. The extent of disease, positive margins, dural involvement, facial nerve paralysis, cranial nerve involvement, or moderate to severe pain on presentation have been associated with poorer outcomes . When resected with free margins, 5-year survival reaches 100%. With incomplete resection, recurrence rate depends on tumour stage and is reported between 25 to 100% . Note: secondary EAC involvement from regional primary SCC is much more common than primary EAC squamous cell cancer. The middle ear is hidden behind the tympanic membrane, what makes direct non-invasive evaluation limited in many cases. Although the pathology itself can be well estimated on otoscopic examination, further questions concerning the extent of the disease, exact location, structures involved and possible bone erosion, will be addressed in detail only with CT and/or MRI. The majority of everyday practice cases will consist of inflammatory diseases, either chronic or acute, and sometimes tumours. On CT examination, these entities will demonstrate a mass, or a diffuse opacification of middle ear cavity . Since an opacified middle ear is a common finding on imaging studies , a practical classification has been used, in order to facilitate differential diagnosis (Table 3). Trauma to the temporal bone is usually the result of a blunt head injury. Patients with temporal bone fracture may present at the time of trauma with evidence of basilar skull fracture, such as battle sign, raccoon eyes, or hemotympanum. In addition, they may complain of hearing loss or dizziness [18, 19]. If a temporal bone fracture initially goes unrecognised, delayed presentation may involve cerebrospinal fluid (CSF) otorrhea, hearing loss, or symptoms related to cranial nerve VII dysfunction. Because the traditional fracture classification system (transverse and longitudinal) may not predict the presence of sequelae, such as facial nerve injury or CSF leak, fractures should be classified, based on whether they are otic capsule sparing or otic capsule violating (Fig. 11a, b) . Also, hearing would be preserved only when the otic capsule is spared [19, 20]. HRCT images provide detailed information concerning fractures and their complications. Opacification visible on imaging studies in the tympanic cavity may represent blood (Fig. 12) or CSF. Persistent mucoid or serous middle ear effusion, in the absence of acute inflammation . Eustachian tube dysfunction is well known to be related in the pathogenesis of secretory otitis. Secretory otitis is the most common disease in children, sometime it can be seen in adults. In children, this can occur purely from enlarged adenoids, with no pain or bacterial infection. In adults, secretory otitis may be found when a growing tumour in the nasopharynx blocks Eustachian tube opening  (Fig. 15a, b). Fluid filling the middle ear cavity causes tympanic membrane bulging with no signs of acute infection (redness, pain, oedema). Over time, middle ear fluid can become very thick and glue-like (“glue ear”), which increases the likelihood of conductive hearing loss. Temporal bone HRCT is the examination of choice; however, when nasopharyngeal pathology is suspected, contrast-enhanced MRI study should be considered. In children, diagnosis is usually made based on tympanometry, therefore CT should not be ordered. Middle ear cavity and mastoid air cells are completely, homogeneously opacified. There is no ossicular chain erosion (Fig. 16). This includes acute otomastoiditis, acquired cholesteatoma and Langerhans cell histiocytosis. Acute middle ear infection (acute otitis media, acute otomastoiditis) usually presenting with typical clinical image and in most cases not requiring imaging. These include earache, fever, pain, otorrhea, conductive hearing loss. On otoscopy tympanic membrane is red and bulging [1, 2]. Both from clinical and radiological points of view, it is important to differentiate between acute otitis media and secretory otitis . Secretory otitis means fluid in the middle ear cavity without signs or symptoms of infection; this is usually caused when the Eustachian tube patency is compromised and fluid is trapped in the middle ear. Signs and symptoms of acute otitis media occur when effusion in the middle ear becomes infected. Need for imaging usually takes place, if standard treatment fails, and complications occur. Such complications include acute coalescent otomastoiditis (ACOM). This is an acute infection of middle ear and mastoid air cells, with progressive resorption of mastoid septae . Temporal bone HRCT is the modality of choice to evaluate possible ACOM. Erosion of mastoid septations and cortex is the most sensitive and specific finding (Fig. 17). When intracranial complications are suspected, MRI is the examination of choice. Since in severe cases ACOM may lead to severe complications, like abscess formation and sinus thrombosis, the following structures should be evaluated carefully: labyrinth, meninges, sigmoid sinus, skull base. This includes rhabdomyosarcoma, Langerhans cell histiocytosis, acute uncomplicated otomastoiditis and acquired cholesteatoma. Acute otitis media is usually treated with antibiotics, sometimes myringotomy. With complicated ACOM, surgery and mastoidectomy are usually needed. When the inflammation persists at least 6 weeks and is associated with otorrhea through a perforated tympanic membrane, chronic otitis media (COM) is diagnosed . These include conductive hearing loss, sometimes pain, vertigo, otorrhea. Both CT and MRI are used in the evaluation of COM and its complications. HRCT is the best tool to evaluate ossicular chain and tympanic cavity walls. However, CT is unable to differentiate between different types of effusions in the tympanic cavity, also evaluation of cholesteatoma can be challenging [17, 24]. MRI plays role in the detection of primary and residual cholesteatoma, also when intracranial and some intratemporal complications are suspected. Since some ears with chronic inflammation develop cholesteatoma, COM may be classified into two groups: with or without cholesteatoma. Presence of fibrous tissue, usually in the niche of oval window, forming a so-called “peristapedial tent” (Fig. 18). Fibrous tissue may also be present anywhere in mesotympanum and epitympanum. Tympanosclerosis, which reflects deposits of hyalinised collagen in the tympanic cavity. If it occurs in tympanic membrane, it is called myringosclerosis (Fig. 19). In the tympanic cavity, it may be present in any location, visible as focal calcified densities in the middle ear cavity, along tendons, also in direct apposition to the ossicular chain (Fig. 20). Formation of new bone, rarely seen in the tympanic cavity, usually in epitympanum. Visible as lamellar structures of high density. Differential diagnosis of radiological images includes congenital cholesteatoma in the middle ear. Post-inflammatory ossicular chain erosion is rather rare in case of a non-cholesteatomatous disease, but may seldom occur and will affect first the incus long process and lenticular process, followed by stapes head . For best diagnostic accuracy, images should be viewed in correct bone window setting—large window width (e.g. 4,000 HU) and low window level (e.g. 0–200 HU). 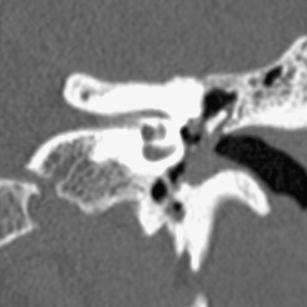 In cases of post-inflammatory ossicular chain erosion, any or all of three signs will not be visualised on axial CT scans. Differential diagnosis includes congenital ossicular deformity, cholesteatoma with ossicular erosion, post-operative ossicular loss. Cholesteatoma means “skin in the wrong place”. It consists of squamous epithelium that is trapped within the middle ear and mastoid . In the setting of chronic middle ear inflammation, cholesteatomas arise as the result of tympanic membrane retraction or perforation [24, 25]. The classic acquired cholesteatoma develops from medial retraction of the pars flaccida into the epitympanum (pars flaccida cholesteatoma). As this process continues, the scutum becomes eroded; ossicular destruction is common. If the cholesteatoma invades posteriorly into the aditus ad antrum and the mastoid itself, erosion of the tegmen tympani, with exposure of the dura and/or erosion of the lateral semicircular canal may appear  (Fig. 24). A second, less frequent type of an acquired cholesteatoma arises when the posterior quadrant of the tympanic membrane is retracted into the posterior middle ear (pars tensa cholesteatoma). As retraction continues, squamous epithelium envelops the suprastructure of the stapes and fills in sinus tympani. Cholesteatomas arising from the posterior tympanic membrane are likely to produce facial nerve exposure, eroding bony cover of facial nerve canal, and destruction of the stapedial suprastructure [26, 27]. Those symptoms typical for cholesteatoma include painless otorrhea, persistent or frequently recurrent in spite of aggressive antibiotic treatment, conductive hearing loss, rarely vertigo. Solely surgical. Surgery is usually performed with canal wall up tympanoplasty, where the wall of external auditory canal is preserved, and sometimes canal wall down procedure, when the wall of external auditory canal is removed and large mastoid cavity is left [24, 26–28]. Detailed description of these two methods, their advantages and disadvantages are beyond the scope of this review. The preferable imaging method depends on the type of cholesteatoma. Differentiation should be made between patient evaluation prior to first stage surgery and patient evaluation prior to second-stage surgery looking for residual cholesteatoma. Both imaging techniques—CT and MRI—are valuable but the choice depends on the clinical situation. 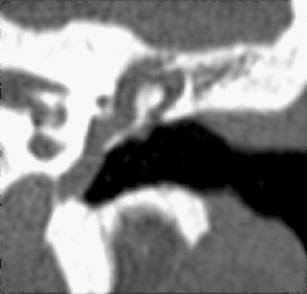 soft tissue mass in Prussak’s space, medial to attic wall, lateral to head of malleus and body of incus, often accompanied by scutum and ossicle erosion—most commonly long process of incus (Fig. 25a, b). Ossicles are very often displaced medially. erosive mass of soft tissue density in posterior tympanum, medial to ossicles, may involve sinus tympani, facial recess, mastoid (Fig. 26). Early ossicle erosion is usually present (incus long process, stapedial superstructure, manubrium of malleus). Ossicles can be displaced laterally. Moderate intensity on T2-weighted images, clearly lower than the hyperintensity of inflammation. In case of a clear-cut clinical and otoscopical image of a cholesteatoma, CT will do as primary and sole imaging technique prior to first-stage surgery. It will be able to demonstrate ossicular and epitympanic erosion and will nicely show tegmen delineation. Facial nerve canal and lateral semicircular canal integrity can be evaluated as well. However, in case of suspected infection/inflammation and/or complications such as fistulisation to the lateral semicircular canal, MRI including delayed post-gadolinium T1-weighted sequences and non-echo planar diffusion-weighted (non-EP DWI) sequences is required. It will be able to differentiate the infection/inflammation from the cholesteatoma and it will show the status of the membranous labyrinth. In case of an unequivocal clinical suspicion of cholesteatoma, non-EP DWI sequence alone can be used as a screenings tool to exclude the presence of cholesteatoma.The approach, however, becomes completely different in patient evaluation prior to second look. In these cases, CT cannot distinguish between different types of soft tissues in the resection cavity (granulation tissue, effusion, scar tissue or cholesteatoma). CT has a high negative predictive value only in a well aerated middle ear and post-operative cavity. However, this is seldom seen. In the literature, two MRI techniques have been described for the evaluation of pre second look patients: delayed post-gadolinium T1-weighted sequences and diffusion-weighted MRI (EPI as well as non-EPI) or a combination of both techniques. Non–EPI is regarded as far superior to EPI. Using the combination of non-EP DW sequences and delayed post-gadolinium sequences, a high sensitivity (90%) and specificity (100%) was achieved in detection of residual and recurrent cholesteatoma. Recent literature has also demonstrated that non-EP DWI sequences alone have the same sensitivity, specificity, positive predictive value and negative predictive value that the combination of non-EP DWI plus delayed post-gadolinium T1-weighted sequences together (Fig. 28a, b) . Paraganglioma that arises in glomus bodies situated in the cochlear promontory. It is the most common primary neoplasm of the middle ear . When growing typically lateral to the cochlear promontory, may abut the inner margin of the tympanic membrane, and present with conductive hearing loss and a red, pulsatile, vascular retrotympanic mass. Other clinical symptoms include pulsatile tinnitus and, rarely, facial nerve paralysis [29, 30]. HRCT should be the examination of choice, if GTP is clinically suspected. In other settings a thin-slice CT before and after contrast provides the diagnosis. MRI is used, if based on CT findings glomus jugulotympanicum is suspected. Clinically relevant imaging findings: on CT images GTP presents typically as a soft-tissue mass, with a flat base on cochlear promontory, vividly and quickly enhancing after contrast medium administration (Fig. 29a, b). Large GTP can fill whole middle ear cavity; this could result in fluid collection in mastoid. The floor of the middle ear cavity should be intact—if dehiscent or permeative, glomus jugulotympanicum should be suspected (Fig. 30). 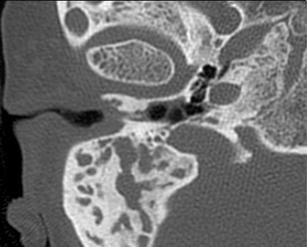 Very large GTP may show so-called “aggressive” bone changes—eroding the medial wall of the middle ear cavity and ossicles. For the most efficient communication with ENT surgeons, GTP should be evaluated according to Glasscock-Jackson classification  (Table 4). Differential diagnosis includes aberrant internal carotid artery, dehiscent jugular bulb, glomus jugulotympanicum paraganglioma, facial nerve schwannoma from tympanic segment. Treatment is solely surgical, but in elderly patients may not be necessary, since GTP grows very slowly. tumour arising within middle ear cavity, originating from the facial nerve, chorda tympani nerve (7th branch), Jacobson nerve (9th branch), or Arnold nerve (10th branch), with the facial nerve being the most common nerve of origin. Schwannomas have been identified along the entire course of the facial nerve, although intratemporal tumours appear to be much more common than intracranial tumours. Within the temporal bone, the most common sites of involvement, in descending order, are the geniculate ganglion, labyrinthine segment, tympanic and vertical segments, and the internal auditory canal . Clinically middle ear schwannomas present with conductive hearing loss and sometimes with facial nerve dysfunction. On otoscopy they are visible as fleshy-white mass behind intact tympanic membrane. MRI before and after contrast enhancement. Schwannoma is isointense or hypointense on T1-weighted images, hyperintense on T2-weighted images, and markedly enhances with gadolinium contrast. 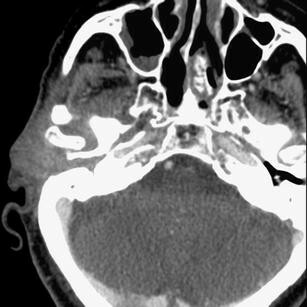 An enhancing enlargement of varying thickness along a large segment of facial nerve is considered highly suggestive of schwannoma. Although high-resolution CT scanning can reveal these tumours because of their osseous erosion and enlargement of facial nerve canal (Fig. 31), MRI is a more sensitive diagnostic tool [8, 32]. However, both modalities are useful for surgical planning. Middle ear schwannoma, when not originating from 7th nerve, is seen within middle ear cavity as a well-marginated mass without facial canal involvement. Differential diagnosis includes congenital cholesteatoma, glomus tympanicum paraganglioma, middle ear adenoma. Many diseases of the external and middle ear are difficult to recognize and evaluate based on radiological images only, without knowledge concerning clinical symptoms and otoscopy findings. Apprehension of the clinical picture facilitates radiological investigation, substantially narrows differential diagnosis and helps avoid mistakes . Many pathological conditions of the external and middle ear do not require diagnostic imaging; the need for imaging comes when complications are suspected or treatment is not effective. Evaluation of such cases requires close cooperation between the clinician and radiologist. When malignancy is suspected or surgery is the treatment option, radiological report should include practical information necessary for the surgeon; this can be achieved by using international grading systems or classifications. The authors are very grateful to Dr Bert De Foer, from Department of Radiology, GZA Hospitals Sint-Augustinus, Antwerp, Belgium, for expert advice concerning cholesteatoma imaging and permission to use examples of non-EPI DW images.